The glorious Long Shot CS-6 has been re-released at Toys'R'Us. This is a great blaster if you didn't already know. The price tag is high, but it's worth it if you are a modder or want the best of the best (which isn't fully-automatic like the Stampede). The Nerf Barricade RV-10 has been released and is a reasonable price at Play.com. As they are semi-automatic and a low price, if you have big hands and don't mind some noise, they are fantastic for dual-wielding. Here's a great review by SG Nerf. 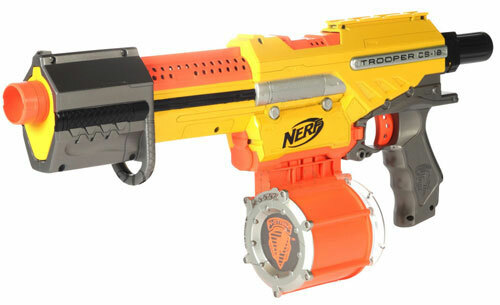 The Nerf Alpha Trooper CS-18 is available at Argos, although is over-priced if you include the £5.95 delivery cost. Here's another review by SG Nerf. Orange Mod Works, a new company providing Nerf modding resources, have set up a website with an in-depth modding guide for the Nerf Recon CS-6. They are also releasing high performace replacement internal parts for several Nerf blasters, starting with the Recon. I'm being sent the first kit now and will have a review up of it in the next couple of weeks. I'm expecting great things! The Nerf Barrel Break IX-2 is available at Toys'R'Us, but is overpriced unless your REALLY love double-barrel shotgun toys. The beastly Nerf Stampede ECS has gone down in price over at Play.com, it's now only £42.79 with free shipping. Nerf have released several different colour schemes for existing blasters, and some new Dart Tag blasters, but not in the UK yet. Nerf/Hasbro have released a good looking, but generally under-whelming set of Super Soakers this year. The Nerf N-Strike Havok Fire EBF-25 has become rare, and very expensive. The Longstrike CS-6 is still over-priced everywhere (still more expensive than the Raider CS-35. The UK stocklist is currently very outdated. I will probably be taking this page down or simplifying it because I cannot spend as much time as I used to managing it. The Location Database, on the other hand, is still relevant and I urge any avid Nerfers from the UK to put themselves on it too.